Probably one of the nicest weirs to fish on the Goyt (see pic), although the main feature has now been washed away due to this/last years ridiculous amount of water. Alas fishing here may well cease if the planned "green" hydro scheme goes ahead... It's on hold at the moment as they look into some trees that were cut down that were home to some protected Bats. Horse, stable and bolt springs to mind. That tree stayed there for more than two seasons, before being dislodged. It's a cracking weir, as is the river. I plan to christen my (not really) new B James MKVI carp rod with a large barbel very soon, on a spot not a million miles from the weir. Well, any barbel will do at this time of year. Where abouts is that wier? I was born around the Bredbury area and the Goyt nearer Stockport was heavily poluted in the 50s and 60's. There was a story in the local press of someone throwing a stick in for their dog to fetch and the dog (a Red Setter) later changed colour due to the amount of pollutants in the water. I revisited in the 70's and heard that it had been cleaned up and the fish were returning and thriving. Nice to know somewhere is flourishing. 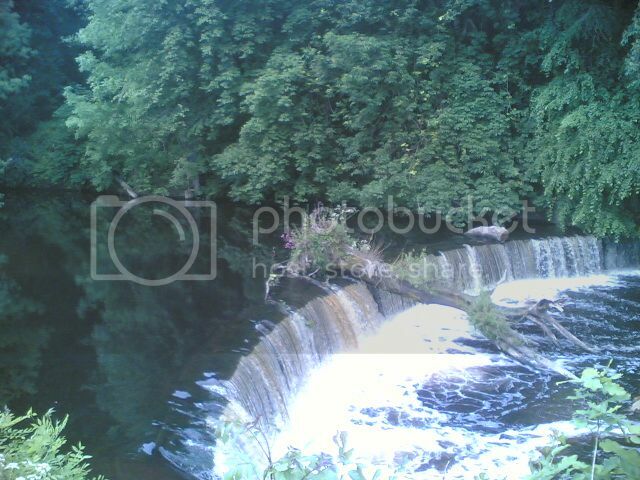 There were 3 rivers within walking distance of my house as a youngster, the Goyt, Mersey and Tame. All were polluted and unfishable. All my fishing as a lad was done on the canals and ponds in the area and my first river was fished at around 13 years of age (1968) due to the kindness of a family friend who took me on the Dane and Weaver. The rumour I heard about the Goyt came from a non angler so I treated it with a pinch of salt, so it really is nice to know it is indeed thriving. Ha ha, yes indeed. I'm from Bristol originally, then London and now Manchester. The Goyt is a real gem and, although there aren't any 'banker' swims, there's always a chance of a nice barbel or two. There are also a few barbel in the Tame (Goyt escapees) and, by association, they must also be in the Mersey. I'll be down there in, too, January with my cane rod - if there's a mild spell. Stockport Federation of Anglers control most of the fishing, however there's a free stretch downstream of the road bridge at Pear Mill. Well, a pleasing start to 2014, and a fish to christen my MKIV Carp rod and Lewtham side-cast reel. A lovely little splasher!